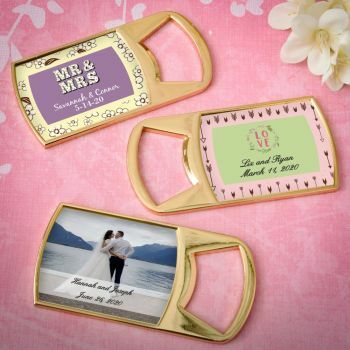 Choose these classy gold metal bottle openers as favors for your next grand occasion. They can be personalized with a label designed by you, that fits into the plaque shaped inset opening. The inset is the perfect place to put your personalized label . Choose from an exceptional selection of colors, exciting border designs, adorable themes and customized titles for any type of occasion and add your name and date. Now also available is your custom photo upload of your special picture or design that is totally your own creation. Use our exclusive Design Tool to create your own label and preview it online before you order. The personalized labels come on easy peel and stick sheets. Some assembly is required. Please allow 3-4 days for production. NEW feature - personalize with a full color photo or custom artwork designed by you!